A rubber ball is dropped from rest at a fixed height. It bounces off a hard floor and rebounds upward, but it only reaches 90% of its original fixed height. 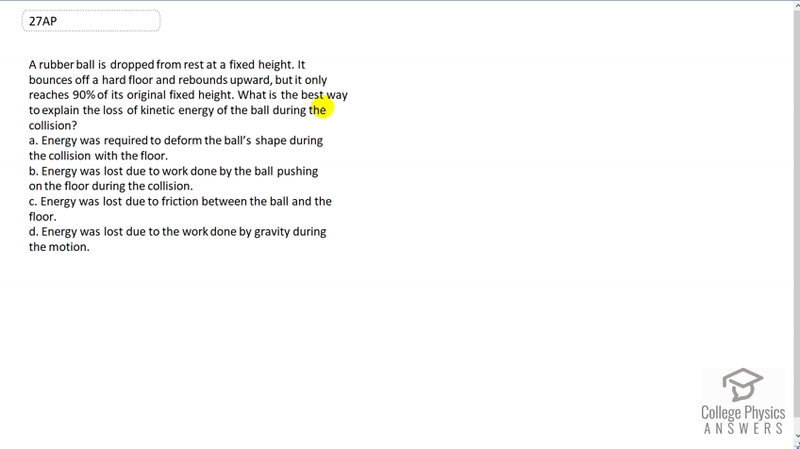 What is the best way to explain the loss of kinetic energy of the ball during the collision? Energy was required to deform the ball’s shape during the collision with the floor. Energy was lost due to work done by the ball pushing on the floor during the collision. Energy was lost due to friction between the ball and the floor. Energy was lost due to the work done by gravity during the motion. This is College Physics Answers with Shaun Duchko. A rubber ball is dropped from a height and it bounces back to 90 percent of its original position. So we have to explain what happens to the loss of kinetic energy during the collision. C is a tempting answer to think about because you see the word friction and friction is often an explanation for how kinetic energy disappears because it often turns into heat and so on, due to friction. But there is not very much friction between the ball and the floor. I suppose there might be a very tiny bit but not enough to explain losing ten percent of its original height. So the answer is going to be A because as the ball deforms like this, there is internal friction happening between the molecules making up the ball. So that internal friction is what's going to cause energy to be lost in the form of heat. In fact, if you ever played squash it's common to warm up the squash ball by hitting it against the wall a whole bunch of times before starting a game. You'll notice that the squash ball becomes really hot from all this bouncing back and forth and that's the friction caused by being squished.